David Hugh Murray was born on 14 Mar 1853 in Launceston and died on 20 Jan 1885 in Horton, now Circular Head at age 31. David Hugh Murray originally went to sea as an apprentice. In October 1880 David Hugh Murray applied to become a teacher at the Duck River School in Tasmania, which, at that time, did not have a teacher. He stated that he was 27 years of age, that his native place was Launceston (Tasmania), that his religious denomination was Wesleyan Methodist, that he had had no previous teaching experience, and that the nature of his present employment, was farming. He supplied a reference from a Mr. W.H. Kidd, of Launceston (Tasmania). At the time, David Hugh Murray was living at Duck River, Tasmania. David married Annabella Mary Reid, daughter of Henry Grieg Reid and Eleanor Barrett, on 13 Jul 1878 in Horton, now Circular Head. Annabella was born about 1849. They had three children: Alexander, Annabella and Hugh Henry. 6-Alexander Murray was born on 28 May 1879 in Horton, now Circular Head, died on 2 Jun 1953 in Somerset at age 74, and was buried in General Cemetery, Somerset, Tasmania. He wasa farmer, of Cooee, Tasmania. Alexander married Evelyn Janet Kay, daughter of John Ferguson Kay and Hannah Ann Williams, on 20 Jun 1910 in Tasmania. Evelyn was born on 19 May 1893 in Montagu, died on 10 Aug 1963 in Somerset at age 70, and was buried in General Cemetery, Somerset, Tasmania. They had six children: John Clyde, Clarence, Ronald Hugh, Myra, Hazel and Alice Jean. 0-Bonnie-Eliza Lerlene Murray was born on 21 Jul 1991 in Burnie, Tasmania, Australia. 9-Michael Andrew Murray was born on 7 Feb 1969 in Burnie, Tasmania, Australia. 8-Colin John Murray was born on 14 Jun 1938 in Smithton. Colin married Janice Margaret Hutchison, daughter of Alec Hutchison and Meg Nicholls, on 24 Mar 1962 in Gospel Hall, Wynyard, Tasmania. Janice was born on 2 Jan 1944 in Wynyard, Tasmania. They had four children: Russell John, Shereelyn Lea, Peter David and Louise Helen. 10-Xavia Murray. Allan next married Faye Dixon. 9-Hannah Rawlings. Dean next married Joy. They had three children: Dean, Richard and Clint. Andrew James Murray was born on 2 Jun 1855 in Richmond Hill, Sidmouth and died in Queensland. Andrew married Ruby Rostron, daughter of John Rostron and Unknown. They had one son: Harry. Thomas Mervin Murray was born on 21 Jan 1858 in Longford, Tasmania and died on 1 Apr 1858 in Longford, Tasmania. Clara Murray was born on 17 Jun 1859 in Longford, Tasmania, died on 29 Sep 1948 in Perth, Western Australia at age 89, and was buried in Karrakatta Cemetery, Western Australia. THE death occurred on Sunday at a private hospital in Western Australia of Miss Clara Murray, eldest daughter of the late Mr. and Mrs. A. Murray, of Malvern, Victoria. Miss Murray, who was born in Tasmania, preserved many interesting documents and diaries be- longing to her grandfather, the late Mr. David Murray, who came from Scotland in 1824, and settled in the Midlands. For many years Miss Murray was principal of the Malvern Ladies' College, and was a keen supporter of the Presbyterian Church. 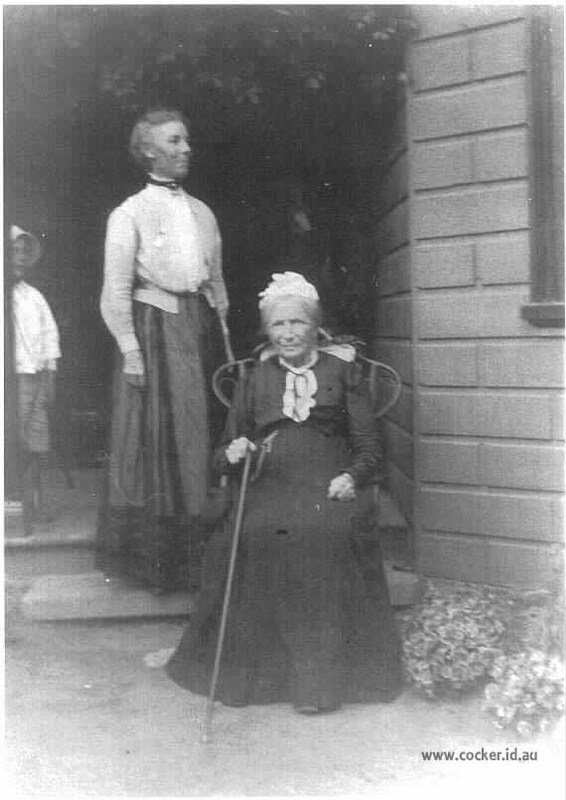 She is survived by two sisters Mrs. Hill and Mrs. Hutchison (Launceston). Clara Murray was the Principal of Malvern Ladies College. From 3 April 1883 Miss Murray conducted a school from the room between St George's Church and the Malvern Police Station. Malvern Ladies College was founded by Miss Murray at this school room and between 1890 and 1892 the school moved to the weatherboard schoolhouse at 14 Valetta Street. In 1911 the school merged with Korowa Girls School. Miss Murray then set up a hostel for the children of missionaries in one of the houses. In 1905 Malvern Ladies College (number 520) had 31 students enrolled. At Valletta Street Miss Murray had two adjoining houses, one was used as a boarding house and the other was used as the school. Harry Clyde Murray was born on 23 Jul 1861 in Longford, Tasmania and died in 1932 in Bunyip, Victoria at age 71. Harry married Alice Mary Downward, daughter of John Downward and Charlotte Bird, in 1885 in Victoria. They had three children: Clyde Campbell, Andrew Keith and Marjorie Elizabeth. 6-Clyde Campbell Murray was born in 1886 in South Yarra, Melbourne, Victoria and died in 1956 in Heidelberg, Victoria at age 70. Clyde married Mary Dell Harman in 1925. 6-Andrew Keith Murray was born on 19 Oct 1887 in South Yarra, Melbourne, Victoria and died on 5 Aug 1975 in Warragul, Victoria at age 87. Andrew married Kathleen Alice Speed on 6 Mar 1928. Kathleen was born on 1 Aug 1906. They had five children: Patricia, Helen Lesley, Lynette, Stuart Keith and Andrew Bruce. 7-Patricia Murray was born on 9 Jul 1929. 7-Helen Lesley Murray was born in 1933 and died in 1934 in Warragul, Victoria at age 1. 7-Lynette Murray was born on 12 Sep 1936. Lynette married Alan Trewin. They had three children: Christopher Laurence, Vicki Suzanne and Glen Clifford. 8-Christopher Laurence Trewin was born on 27 Jan 1955. Christopher married Elaine Perry. They had three children: Simon Christopher, Creighton Stuart Jarred and Tanya Suzanne. 9-Simon Christopher Trewin was born on 23 Sep 1975. 9-Creighton Stuart Jarred Trewin was born on 26 Mar 1980. 9-Tanya Suzanne Trewin was born on 7 Oct 1985. 8-Vicki Suzanne Trewin was born on 4 Feb 1957. 8-Glen Clifford Trewin was born on 25 Apr 1958. Glen married Heather Parkinson. They had two children: Mark Clifford and Kate Marie. 9-Mark Clifford Trewin was born on 24 Jul 1984. 9-Kate Marie Trewin was born on 16 Jun 1989. 7-Stuart Keith Murray was born on 23 Mar 1938. Stuart married Margaret Ellen Cooper. They had two children: Leonie Frances and Darryl. 8-Leonie Frances Murray was born on 30 Dec 1963. 8-Darryl Murray was born on 6 Mar 1965. 7-Andrew Bruce Murray was born on 1 Jul 1945. Andrew married Lorraine Paterson. They had three children: Kerry Ann, Darren and Cherryl. 8-Kerry Ann Murray was born on 29 May 1965. Kerry married Grant Moyle. They had one son: Kyle. 9-Kyle Moyle was born on 9 Jul 1990. 8-Darren Murray was born on 4 Dec 1966. 8-Cherryl Murray was born on 6 Nov 1968. 6-Marjorie Elizabeth Murray was born in 1899 in South Yarra, Melbourne, Victoria. Marjorie married James Auchterlonie in 1930. Elizabeth Jane Murray was born on 17 Apr 1863 in Longford, Tasmania and died in 1936 in Cohuna, Victoria at age 73. Marion Murray was born on 7 Oct 1866, died on 31 Mar 1960 in Launceston at age 93, and was buried in Apr 1960 in Carr Villa Cemetery, Launceston, Tasmania. Marion married Joseph Hill. Joseph was born in Trusthorpe, Lincolnshire, England. Anne Thomson Murray was born on 29 Nov 1868 in Morven and died on 28 Jun 1947 in Perth, Western Australia at age 78. Anne married Alfred Daniel Randall JP, son of Alfred Randall and Margaret McEwan, on 10 Apr 1899 in Victoria. Alfred was born on 1 Aug 1864 in Loddon, Victoria and died on 4 Sep 1919 at age 55. They had seven children: Ann Elizabeth Joan, Clara Isobell, Jean Margaret, Marion Murray, Alfreda Annie, Daniel George and Andrew Murray. 6-Ann Elizabeth Joan Randall was born on 2 Mar 1900 in Cohuna, Victoria and died on 21 Jul 1901 at age 1. 6-Clara Isobell Randall was born on 17 Jul 1901 in Melbourne, Victoria and died in Bendigo, Victoria. Clara married Henry Stone on 8 Feb 1933. They had two children: Elizabeth Anne and Douglas Henry. 7-Elizabeth Anne Stone was born on 26 May 1934. 7-Douglas Henry Stone was born on 2 Feb 1939. 6-Jean Margaret Randall was born on 20 Nov 1902 in Cohuna, Victoria and died on 11 Feb 1993 in Perth, Western Australia at age 90. A visitor to Tasmania during the last ten days has been Miss Jean M. Randall, M.A., lecturer in French at the University of Vestern Australia. Miss Randall is a great-granddaughter of Mr. David Murray, who came to Campbell Town in 1824, and a great-great-niece of Mr. Hugh Murray, his brother, who arrived in Tasmania two years before that. This was Miss Murray's first visit to Tasmania. She, travelled 700 miles during her stay, and expressed herself as delighted with her holiday and what she had seen. Miss Randall is a niece also of Mrs. Arthur Hutchison, of Denison Road, Launceston. She returned to the mainland yesterday en route to Perth to take up her duties. 6-Marion Murray Randall was born on 11 Jan 1904 in Cohuna, Victoria and died on 19 Nov 1991 in Perth, Western Australia at age 87. Marion married Malcolm Graeme (Ted) Murray, son of John Thompson Murray and Constance Stephenson, on 12 Jan 1946. Malcolm was born on 17 Oct 1906 in Fremantle, Western Australia and died on 19 Nov 1991 in Perth, Western Australia at age 85. They had three children: Malcolm Randall, Melissa Lea and Catherine Randall. 7-Malcolm Randall Murray was born on 30 Oct 1947 in Perth, Western Australia. Malcolm married Denise Annette Chapman on 15 Feb 1969. Denise was born on 3 Dec 1949. They had three children: Melissa Lea, Catherine Randall and Claire Elizabeth. 8-Melissa Lea Murray was born on 19 Oct 1971 in Perth, Western Australia. 8-Catherine Randall Murray was born on 12 May 1974 in Perth, Western Australia. Catherine married Andrew Jackson on 22 Jan 2000. They had two children: Eva May and Thomas Theodore. 9-Eva May Jackson was born in Feb 2004. 9-Thomas Theodore Jackson was born in Dec 2005. 8-Claire Elizabeth Murray was born on 5 Dec 1977 in Perth, Western Australia. 7-Catherine Randall Murray was born on 12 May 1974 in Perth, Western Australia. Catherine married Andrew Jackson on 22 Jan 2000. They had two children: Eva May and Thomas Theodore. 8-Eva May Jackson was born in Feb 2004. 8-Thomas Theodore Jackson was born in Dec 2005. 6-Alfreda Annie Randall was born on 8 Jun 1905 in Cohuna, Victoria and died on 21 Mar 1921 at age 15. 6-Daniel George Randall was born on 3 Nov 1906 in Malvern, Victoria and died on 16 Dec 1969 in Melbourne, Victoria at age 63. Daniel had a relationship with Nancy Elizabeth Kneen, daughter of Thomas Alexander Kneen and Alice Margaret Eliza Matthews. This couple did not marry. Nancy was born on 2 May 1914 and was christened on 8 May 2005 in Balwyn, Victoria. Daniel married Elizabeth Jean Brown on 27 Apr 1930. Elizabeth was born in 1908 in Nagambie, Victoria and died in 1975 in Malvern, Victoria at age 67. They had four children: Neil Meredith, Janice, Andrew Michael and Rosemary Anne. 7-Neil Meredith Randall was born on 13 Dec 1935. 7-Janice Randall was born on 23 Dec 1936. 7-Andrew Michael Randall was born on 28 May 1943. 7-Rosemary Anne Randall was born on 20 Apr 1945. 6-Andrew Murray Randall was born on 3 Apr 1910 in Victoria and died in Echuca, Victoria. Andrew married Ada Belle McClure, daughter of James McClure and Martha Brown, on 24 Apr 1937. Ada was born in 1911 and died in 1952 in Echuca, Victoria at age 41. They had three children: Jennifer Margaret, Marilyn Murray and Barbara Isabelle. 7-Jennifer Margaret Randall was born in 1941 in Cohuna, Victoria. 7-Marilyn Murray Randall was born on 2 Oct 1945. 7-Barbara Isabelle Randall was born on 4 Nov 1948. Martha Murray was born on 29 Oct 1871 in Evandale, Tasmania, died on 24 Sep 1949 at age 77, and was buried in Carr Villa, C3/328. Another name for Martha was Myra. 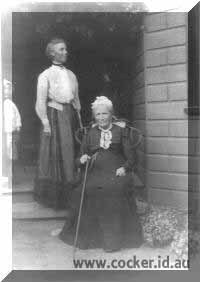 Martha Murray (usually called Myra), born on 29 Oct 1871 at Evandale, was the fifth daughter of Andrew Carmichael Murray (1824-1886) and Elizabeth Reid who were married on 21 May 1851. Myra married Arthur Newton Hutchison on 19 Apr 1906. The couple had three children: Geoffrey Arthur James, 1907-1990; Ellaline Martha Esme, 1910-1975 and Reginald George Murray, born 1914. 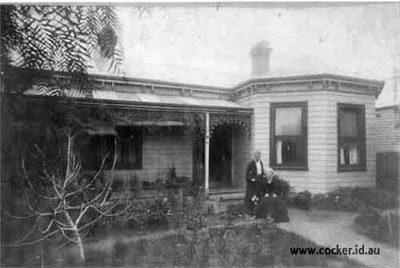 The children were all born at 'Dunira', 102 Tamar Street, where Myra's aunt Margaret Annabella Murray had been Principal of a ladies' school for several years and where Myra also lived for a time prior to her marriage. Myra was the main beneficiary of the estates of two of her aunts, Margaret Murray and Martha Lyne (nee Murray). Myra died aged 76 on 24 Sep 1949 and was buried at Carr Villa in Section C3 No 328. Her husband Arthur had died on 13 Apr 1944. Yesterday at 2.30, at the Patterson street Methodist Church, was solemnised the marriage of Myra, daughter of the late Mr. A. C. Murray, Victoria, and adopted daughter of Mrs J. Lyne, "Dunira," Tamar-street, with Mr. Arthur Hutchison, son of the Rev. James Hutchison, Malvern, Victoria. The ceremony was performed by the Rev. S. T. Withington, and Miss Annear pre- sided at the organ. "The Voice that Breathed o'er Eden " was sung, and as the bridal party left the church Mendelssohn's Wedding March was played. The bride entered the church with Sir William Lyne, by whom she was given away. The bridal gown was ivory, Louisene silk, made with full plain train, bordered with French knots. 'The bodice had a yoke of tucked chiffon, and bertha of Mechlin lace, caught with chiffon roses, and long spray of orange blossoms at the left side; the elbow sleeves were finished with ruffles of Mechlin. The long tulle embroidered veil (which was worked by the bride's sister, Miss Clara Murray, Victoria) was held in place with a cluster of orange blossoms. The bouquet of bouvardia roses, carnations, and trails of asparagus fern, tied with a sash of ivory ribbon was presented by the bridegroom. The Misses Lily Murray and Muriel Grubb were bridesmaids. Their gowns were respectively of lovely blue and pink taffeta chiffon over silk, the skirts were slightly trained, and the bodices were finished with beautiful ivory lace; they wore long tulle veils from a coronet of small blossoms to match their gowns. Each carried a white crook decorated with white cos- mos and bouvardia, and ribbons to match the gown. These, with gold bar brooches, set with a bow of pearls, were the gifts of the bridegroom. Mr. G. Hutchison, was best man, and the Rev. Dallas Smith, of Ross, was groomsman. The church was very prettily decorated by girl friends of the bride with white flowers, asparagus fern, and grasses, with festoons of autumn leaves. Festoons of white and green crepe paper were also effectively used. The bridal party and guests were afterwards entertained by Mrs. J. Lyne and Miss Murray at a wedding tea at the Masonic Hall, served by Miss Kate Barkway. The hall was elaborately decorated with beautiful foliage plants, large baskets of marguerite daisies, and the finest white chrysanthemums and masses of cosmos. An arch of foliage and cream roses was arranged where the bride and bridegroom stood to receive, and here were the initials M. and A. entwined. The tables had silver and crystal vases, filled with cream roses, vio- lets, cosmos, and dainty ferns that were beautiful. Mrs. J. Lyne wore a trained gown of satin de chene, the bodice was hand-somely trimmed with silk and chenille applique, over a vest of cream mousseline de sole; black and white bonnet. Miss Murray, gown of black brocaded poplin, with white tucked chiffon yoke, finished with applique; bonnet of black chenille applique, with knot of pink velvet. Mrs. A. C. Murray, heliotrope silk, with silk Maltest bertha and long black moire coat; black bolmet with violets. Miss Clara Murray (Victoria), costume of French grey tweed, with tomato red facings; toque to match. The guests included Mrs. A. C. Murray, Miss Murray, Sir W. Lyne, Mrs. Henry Reed, Mr. and Mrs. Parramore, Misses E. and M. Parramore, Mr. and Mrs. J. Hutchison, Mrs. H. T. A. Murray, Misses E. and C. Murray, Mrs. D. Murray, Miss J. Murray, Mr. and Mrs.C. Lyne, Miss C. Lyne, Mr. C. Lyne, Mr. and Mrs. L. Murray, Mr. and Mrs. Trevor Murray, Miss V. Lyne, Mr. and Mrs. T. C. Archer, Mrs. Stephenson, Miss Ste- phenson, Mr. and Mrs. C. B. Grubb, Mrs. Willett (Victoria), Mr. and Mrs. and Miss Tulloch, Rev. T. Withington, Miss Withington, Misses C. and F. Grubb, Mrs. W. Grubb, Miss Harley Grubb, Mrs. Sams, Miss Harrop, Miss K.Mathieson (Victoria), Mr. and Mrs. and Miss Ozanne, Mr. Burgess, Dr Heyward, Mr. and Mrs. Sale, Mrs. H. I. Rooke, Miss Winter, Rev. S. Morrison, Mrs. R. Parker, Miss Parker, Mr. Brady, Misses L. and M. Gibson, Miss Bennett, Miss Fox, Miss Wettenhall. Martha married Arthur Newton Hutchison, son of James Hutchison and Jane Eliza Kerr, on 19 Apr 1906. Arthur was born on 19 Sep 1864 in Hobart, Tasmania and died on 13 Apr 1944 at age 79. They had three children: Geoffrey Arthur James, Ellaline Martha Esme and Reginald George Murray. 6-Geoffrey Arthur James Hutchison was born on 27 Apr 1907 in Dunira, Launceston, Tasmania and died in 1990 in Launceston at age 83. Geoffrey married Joan Inglis on 16 Nov 1940. Joan was born on 21 May 1909 and died on 21 May 1945 at age 36. Geoffrey next married Marjorie Buchanan on 10 Oct 1947. 6-Ellaline Martha Esme Hutchison was born on 12 Feb 1910 in Dunira, Launceston, Tasmania and died on 22 Nov 1975 at age 65. 6-Reginald George Murray Hutchison was born on 4 May 1914 in Dunira, Launceston, Tasmania. Reginald married Diana Pike on 29 Mar 1948. They had two children: David Murray and (No Given Name). 7-David Murray Hutchison was born on 28 Dec 1949. 7-Hutchison was born on 26 Jan 1953. John Thompson Murray was born on 18 Jan 1874 in Evandale, Tasmania, died on 17 Sep 1944 in Roleystone, Perth, Western Australia at age 70, and was buried in Karrakatta Cemetery, Western Australia. John was nicknamed "Sugar", as he waas the Perth (Western Australia) Manager of CSR Limited. John married Constance Stephenson, daughter of Francis Ewens Stephenson and Louisa Anne Hobday, on 20 Jul 1899 in Melbourne, Victoria. Constance was born on 17 Apr 1868 in Geelong, Victoria and died on 12 Apr 1957 at age 88. They had four children: Alan, John Stuart, Malcolm Graeme (Ted) and Marion Louise. 6-Alan Murray was born on 30 Oct 1901 in Fremantle, Western Australia, died on 23 Apr 1975 in Tincurrin, Western Australia at age 73, and was buried in Karrakatta Cemetery, Western Australia. Alan married Ethel Linda Williams, daughter of Henry Nelson Williams and Edith Mary Holt, in 1927. Ethel was born on 20 Feb 1904 in Kanowna, Western Australia and died on 10 Mar 1969 in Perth, Western Australia at age 65. They had five children: Constance Mary, Betty Anne, Colin Robert, Margaret Ruth and Joan Marion. 7-Constance Mary Murray was born on 10 Feb 1929 in Narrogin, Western Australia. Constance married William Rosslyn Ward on 22 Mar 1952 in Western Australia. William was born on 13 Aug 1923. They had six children: Donald Ross, Murray John, Trevor Neil, Ian Peter, Helen Kay and Kenneth William. 8-Donald Ross Ward was born on 16 Jan 1953 in Narrogin, Western Australia. Donald married Janette Fay Webster on 6 Oct 1979. Janette was born on 16 Dec 1954. They had three children: Kristy Maree, Lydia Joy and Justin Owen. 9-Kristy Maree Ward was born on 17 Apr 1981 in Narrogin, Western Australia. 9-Lydia Joy Ward was born on 11 Jan 1983 in Narrogin, Western Australia. 9-Justin Owen Ward was born on 1 Feb 1985 in Narrogin, Western Australia. 8-Murray John Ward was born on 9 Jan 1955 in Narrogin, Western Australia. Murray married Gail Rowe on 8 Jan 1979. Gail was born on 4 Dec 1957. They had two children: Mark Darren and Jacki Michelle. 9-Mark Darren Ward was born on 9 Dec 1977. 9-Jacki Michelle Ward was born on 21 Jan 1980. 8-Trevor Neil Ward was born on 16 May 1957 in Narrogin, Western Australia. Trevor married Lorraine Suzanne Heine on 28 Dec 1978. Lorraine was born on 28 Apr 1958. They had two children: Emma Louise and Brooke Ellen. 9-Emma Louise Ward was born on 27 Oct 1981 in Bunbury, Western Australia. 9-Brooke Ellen Ward was born on 19 Jul 1983 in Bunbury, Western Australia. 8-Ian Peter Ward was born on 21 Jun 1960 in Narrogin, Western Australia. Ian married Catriona Campbell on 8 Jan 1994. Catriona was born on 25 Aug 1962. They had two children: Lachlan Robert and Callie Jane. 9-Lachlan Robert Ward was born on 29 Oct 1995 in Adelaide, South Australai. 9-Callie Jane Ward was born on 27 Aug 1997 in Adelaide, South Australai. 8-Helen Kay Ward was born on 27 Aug 1961 in Narrogin, Western Australia. Helen married Robert Gordon Ansell on 4 Dec 1983. Robert was born on 5 Feb 1959. They had four children: Jeremy Robert, Kate Ellen, Matthew Gordon and Kim Louise. 9-Jeremy Robert Ansell was born on 31 Mar 1987 in Perth, Western Australia. 9-Kate Ellen Ansell was born on 12 Jan 1989 in Western Australia. 9-Matthew Gordon Ansell was born on 11 Nov 1990 in Western Australia. 9-Kim Louise Ansell was born on 19 Sep 1993 in Western Australia. 8-Kenneth William Ward was born on 28 Jun 1964 in Narrogin, Western Australia. Kenneth married Michelle Suzanne Lusty on 8 Mar 1998. Michelle was born on 13 Jan 1975. They had one son: Erin. 9-Erin Ward was born on 30 Mar 2006. 7-Betty Anne Murray was born on 6 Apr 1931 in Narrogin, Western Australia. Betty married Colin John Lang on 16 Jul 1955. Colin was born on 13 Jun 1928. They had three children: Beverley Robin, Gary John and Janine Helen. 8-Beverley Robin Lang was born on 8 Jul 1957 in Narrogin, Western Australia. Beverley married Michael Peter Macmillan on 7 May 1983. Michael was born on 23 Mar 1953. They had two children: Samuel James and Benjamin Petrer. 9-Samuel James Macmillan was born on 5 Apr 1987 in Perth, Western Australia. 9-Benjamin Petrer Macmillan was born on 7 May 1990 in Perth, Western Australia. 8-Gary John Lang was born on 19 Oct 1962 in Narrogin, Western Australia. Gary married Susan Patricia Russell on 25 Jun 1988. Susan was born on 10 Jun 1958. They had three children: Cameron John, Mitchell Peter and Eleanor Rose. 9-Cameron John Lang was born on 4 Jan 1990 in Perth, Western Australia. 9-Mitchell Peter Lang was born on 13 Jan 1992 in Perth, Western Australia. 9-Eleanor Rose Lang was born on 22 Sep 1996. 8-Janine Helen Lang was born on 4 Jul 1967 in Narrogin, Western Australia. Janine married Brian Kingsley Dayman on 6 Jul 1991. Brian was born on 13 Mar 1962. They had two children: Courtenay Jane and Nicola Marie. 9-Courtenay Jane Dayman was born on 24 Apr 1996 in Perth, Western Australia. 9-Nicola Marie Dayman was born in Jun 2000. 7-Colin Robert Murray was born on 26 Aug 1935 in Narrogin, Western Australia. Colin married Heather Marjorie Haywood on 17 Jan 1963 in Melbourne, Victoria. Heather was born on 1 Nov 1938. They had five children: Alan Robert, Fraser Ross, John Stuart, Cameron James and Sally Barbara. 8-Alan Robert Murray was born on 3 Mar 1964 in Narrogin, Western Australia. Alan married Gillian Rae Prosser on 29 Dec 1985. Gillian was born on 17 Jul 1964. They had three children: Hannah Louise, Hamish Robert and Jessica Prosser. 9-Hannah Louise Murray was born on 21 May 1991 in London, England. 9-Hamish Robert Murray was born on 29 Aug 1993 in Perth, Western Australia. 9-Jessica Prosser Murray was born on 21 Nov 1996 in Perth, Western Australia. 8-Fraser Ross Murray was born on 28 Dec 1965 in Perth, Western Australia. Fraser married Julie Kay Sandilands on 23 Mar 1996. Julie was born on 21 Apr 1969. They had three children: Amelia Morgan, Alistair William and Eliza Meg Sandilands. 9-Amelia Morgan Murray was born on 5 Sep 1997 in Perth, Western Australia. 9-Alistair William Murray was born in Jan 2000. 9-Eliza Meg Sandilands Murray was born in Jan 2003. 8-John Stuart Murray was born on 28 Dec 1965 in Narrogin, Western Australia. John married Nicole Monahan in 2005 in Melbourne, Victoria. They had one daughter: Estelle Sienna. 9-Estelle Sienna Murray was born on 23 Apr 2006. 8-Cameron James Murray was born on 17 Apr 1972 in Narrogin, Western Australia. Cameron married Fiona Calley on 25 Jan 1997. Fiona was born on 17 Apr 1972 in Narrogin, Western Australia. They had one daughter: Sophie Eloise. 9-Sophie Eloise Murray was born in Oct 2004. 8-Sally Barbara Murray was born on 17 Apr 1972 in Narrogin, Western Australia. Sally married Hakan Yaman in 2005 in Denmark, Western Australia. 7-Margaret Ruth Murray was born on 15 Sep 1938 in Narrogin, Western Australia. Margaret married Reginald Tasman Curran on 2 Nov 1957. Reginald was born on 4 Jan 1927. They had two children: Vicki Anne and Geoffrey Mark. 8-Vicki Anne Curran was born on 24 Sep 1958 in Hobart, Tasmania. Vicki married Trevor Lenegan on 8 Oct 1987. They had two children: Rhiannon Jane and Owen Vaughan. 9-Rhiannon Jane Lenegan was born on 11 Mar 1981 in Perth, Western Australia. 9-Owen Vaughan Lenegan was born on 3 Mar 1983 in Perth, Western Australia. 8-Geoffrey Mark Curran was born on 14 Jun 1951 in Hobart, Tasmania. Geoffrey married Joanne Marie Sweeney on 7 Dec 1996. Joanne was born on 29 Oct 1966. 7-Joan Marion Murray was born on 9 Jun 1943 in Narrogin, Western Australia. Joan married Christopher Charles James Beattie on 14 Jan 1970. Christopher was born on 22 Nov 1934. They had two children: Felicity Jane and Timothy David. 8-Felicity Jane Beattie was born on 15 Jul 1970 in Perth, Western Australia. Felicity married Paul Mackie in Jan 2003. They had one son: Kate Ellen. 9-Kate Ellen Mackie was born in Oct 2004. 8-Timothy David Beattie was born on 14 Jul 1942 in Perth, Western Australia. Timothy married Karen Havercroft in Jan 2000. They had two children: Alex Christopher and Zakary Thomas. 9-Alex Christopher Beattie was born in Dec 2003. 9-Zakary Thomas Beattie was born in Dec 2003. 6-John Stuart Murray was born on 3 Jul 1903 in Fremantle, Western Australia and died on 5 Nov 1996 in Esperance, Western Australia at age 93. John married Stella Campbell on 4 Feb 1946 in Western Australia. Stella was born on 20 Jan 1926. They had three children: Donald Bruce, Peter Thomson and Noel David. 7-Donald Bruce Murray was born on 13 Jul 1947 in Morowa, Western Australia. Donald married Janet Sweetapple on 25 Mar 1993. They had two children: Stella Rose and Bess Eva. 8-Stella Rose Murray was born on 9 Jun 1988 in Esperance, Western Australia. 8-Bess Eva Murray was born on 16 Jan 1990 in Esperance, Western Australia. 7-Peter Thomson Murray was born on 12 Sep 1948 in Morowa, Western Australia. Peter married Jennifer Kerr on 3 Mar 1975. Jennifer was born on 20 Jul 1948. They had five children: Marion Louise, Stuart Andrew, Elizabeth Jane, Hugh David and Noel David. 8-Marion Louise Murray was born on 26 Apr 1976 in Esperance, Western Australia. 8-Stuart Andrew Murray was born on 15 Nov 1978 in Esperance, Western Australia. Stuart married Anne in 2004. 8-Elizabeth Jane Murray was born on 6 Apr 1980 in Esperance, Western Australia. Elizabeth married Scott Wandell in Oct 2005. 8-Hugh David Murray was born on 3 Aug 1981 in Esperance, Western Australia. 8-Noel David Murray was born on 2 Jan 1953. Noel married Sandra Mader on 15 Jan 1977. Sandra was born on 23 Sep 1958. They had two children: Naomi Marie and Anita Lee. 9-Naomi Marie Murray was born on 3 Jul 1978 in Esperance, Western Australia. 9-Anita Lee Murray was born on 11 Jan 1980 in Esperance, Western Australia. 7-Noel David Murray was born on 2 Jan 1953 in Esperance, Western Australia. Noel married Sandra Mader on 15 Jan 1977. Sandra was born on 23 Sep 1958. They had two children: Naomi Marie and Anita Lee. 8-Naomi Marie Murray was born on 3 Jul 1978 in Esperance, Western Australia. 8-Anita Lee Murray was born on 11 Jan 1980 in Esperance, Western Australia. 6-Malcolm Graeme (Ted) Murray was born on 17 Oct 1906 in Fremantle, Western Australia and died on 19 Nov 1991 in Perth, Western Australia at age 85. Malcolm married his first cousin Marion Murray Randall, daughter of Alfred Daniel Randall JP and Anne Thomson Murray, on 12 Jan 1946. Marion was born on 11 Jan 1904 in Cohuna, Victoria and died on 19 Nov 1991 in Perth, Western Australia at age 87. They had three children: Malcolm Randall, Melissa Lea and Catherine Randall. 8-Eva May Jackson was born in Feb 2004. 8-Thomas Theodore Jackson was born in Dec 2005. 6-Marion Louise Murray was born on 17 May 1909 in Fremantle, Western Australia and died on 26 May 2000 at age 91. Marion married John Garrioch Seatter in Jun 1942 in Scotland. John was born in Scotland and died in Nov 1954.